Choke Rod Set for the 1928-29 Model A. Choke rod with chrome plated knob. Comes complete with sleeve and spring. Choke Rod Set 1930-31. Choke rod with chrome plated knob. Comes complete with sleeve and spring. Choke Rod Sleeve 1928-31. This sleeve on the choke rod holds the rod on to carburetor. Made in USA. Choke Rod Spring 1928-31. Black enamel. Made in USA. Choke Rod Grommet Set 1928-31. This is exactly how the A was when it left the factory. This kit contains the upper and lower grommets along with the leather washer and steel washer that goes on the engine side of the firewall. Made in USA. Authentic Accelerator Cap for the 1928-31 Model A Ford. This style of accelerator cap is made just like the original was. It is a fully machined part and it is plated. Made in USA. An exact copy of the original Fulton accessory pedal for the model A Ford. Chrome pedal with rubber insert that matches the Fulton pedal covers. Use with present accelerator by bolting onto the floorboards. Accelerator Spring for the 1928-30 models. This little spring mounts onto the throttle assembly that is bolted to the bell housing to return the gas pedal to the idle position. This early style was used on throttle assemblies that had a removable lever on the end and comes with a pin to reattach the arm. Made in USA. Accelerator Spring for the 1930-31 models. This little spring mounts onto the throttle assembly that is bolted to the bell housing to return the gas pedal to the idle position. Made in USA. A universal ball stud commonly used for carburetor linkage. Ball is 1/4" diameter, threads are 10/32" x 7/16". Overall length is 61/64". Keep nut included. 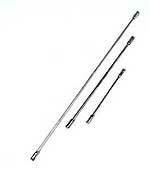 Complete control rod set for the left hand drive Model A. (On Right Hand Drive, the rods are a different length, so you will need to order seperate rods and cut to fit). Set consists of 3 rods: Spark, Throttle & Accelerator. Hand throttle control rod from the steering column to the throttle linkage (LHD only). 6" long. Control rod from the throttle linkage to the carb. (LHD only) 11" long. Control rod from the steering column to the advance retard on the distributor (LHD only) 17" long. If you need to make a custom length control rod, you can use this sleeve. Cut your spark rod and install the sleeve, which locks with two allen set screws. Made in USA. Accelerator Rubber Pad for the 1928-31 Model A. This rubber pad fits both the accelerator cap and the footrest post. Made in USA. Accelerator Footrest for the 1928-31 Model A Ford. Cadmium plated with rubber insert as original. Accelerator Footrest Base for the 1928-34 Ford. A cast aluminium base with screw holes. Made in USA. Three screws used to attach the footrest base to the floorboard. Made in USA.